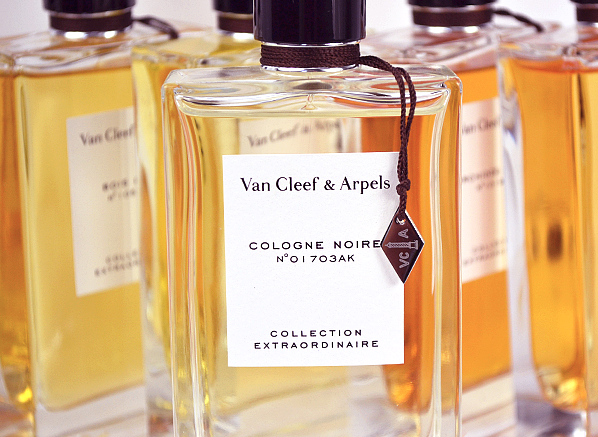 I have a confession to make: up until very recently, the fragrant offerings from luxury jewellery brand, Van Cleef & Arpels, have not been on my radar. This is a crying shame, I know, but it is also something that I have been able to correct with my recent introduction to the brand’s exclusive line – ‘Collection Extraordinaire’ – a series of fragrances that are enjoyable enough to be described as a hidden gem. It would be fair to say that now; the world of Van Cleef & Arpels is no longer a mystery to me. According to Van Cleef & Arpels, the Collection Extraordinaire, is inspired by “the beauty of nature” and each of the fragrances within the collection presents a new and unique take on a particular note. Within the carefully edited line, there is; a surprisingly masculine iris, an aerial jasmine, a brooding cologne, a fleshy gardenia, a delectable vanilla, a floriental disguised as an oud fragrance and a rose perfume bound to nature. It is a varied and interesting line of fragrances that takes from familiar themes and impresses new and enjoyable ideas. In this piece I will be taking you on a thorough exploration of the Collection Extraordinaire, deconstructing, for your pleasure, the varying editions that make it so excellently curated. I’m confident that this is a line with something for everyone, whether you’re an oriental addict or a fancier of florals. But most of all, and as one expects from such an esteemed bastion of luxury, Van Cleef & Arpels have ensured that each of the varying scents within their most precious collection is of the highest quality. Orris butter (iris) is one of the most expensive ingredients in the perfumer’s pallet. Its odour profile ranges from being earthy, carroty and turnip-like to being powdery, violet-esque and ethereal. Iris is often used in feminine perfumes to create a sense of plushness, taking a standard floral to opulent heights as bright pink face powder or dark grey plumage. It’s versatile, often vivacious and always very hard to pin down. For their iris, Van Cleef&Arpels and perfumer, Emilie Coppermann have created something surprisingly masculine, all via the use of some rather robust woods. This is no surprise of course, after all the fragrance is named ‘Bois d’Iris’ (‘bois’ meaning woods) and this moniker serves as a simple breakdown of what the fragrance contain – spiky cedar wood and a subtle, root-y iris. These two ingredients are linked together by black pepper, the metallic crackle of which perfectly matches the spice of cedar against the mineral facets of iris, much like the corresponding numbers in an olfactory game of Dominoes. 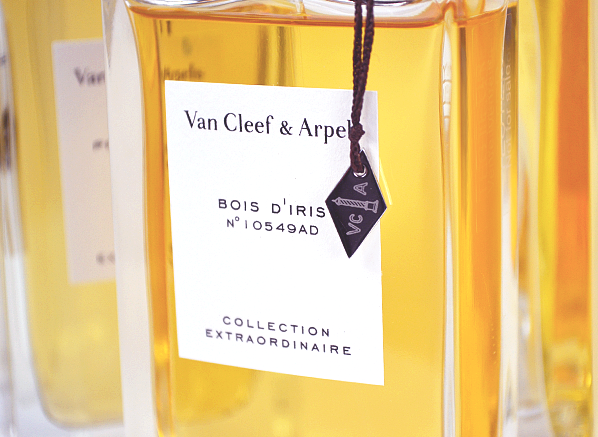 The result is a surprising and unique woody-iris that easily makes for the most interesting and striking fragrance with Van Cleef&Arpels Collection Extraordinaire. Well worth a sniff, I feel. The ‘white floral’ is one of perfumery’s most maligned genres, due in part to the fact that so many fail to replicate the beauty of nature by choosing to exude a veritable foghorn of hyper-sweet and super-long lasting scent. Don’t get me wrong though, a big and blousy white floral can be a wonderful thing (I’m personally all for them), but without the right quality of ingredients and a measured approach, they can often come across as simply ‘too much’. California Rêverie, the latest addition to Van Cleef & Arpels’ Collection Extraordinaire, is the antithesis of ‘too much’. It’s a white floral, based predominately on the narcotic note of jasmine, that deliberately presents a lighter and more airy version of the flower without being watery, thin or ‘generically floral’. It simply is a wonderful essay in restraint, making for a dreamy floral with a jasmine note that feels airborne. Everything about California Rêverie feels floaty, right from the glittery neroli in the opening, right through to the wispy musk and vanilla base. Perfumer Antoine Maisondieu (also responsible for Etat Libre d’Orange’s unusual but remarkable Jasmin et Cigarette) has made a wonderfully delicate jasmine that, unlike some (I’m looking at you Thierry Mugler’s Alien and Serge Lutens’ A La Nuit) is not likely to scare the horses (nor the sensitive noses amongst us), instead it is designed to send one into a dream world where the evening breeze undulates slowly through the flowers as one’s breath rises and falls during a deep sleep. Perfumer Mark Buxton is well known for his dark and brooding woody/incense affairs for avant garde niche brands such as Comme des Garçons. It is no surprise then, that he has arguably penned the most crepuscular fragrance in Van Cleef & Arpels’ Collection Extraordinare – a perfume that is overcast, cold and shadowy, and that speaks of chilly midnight strolls through clouds of icy fog. The twist here is that Cologne Noire isn’t really a cologne at all – it’s all about the ‘noire’. With a true cologne, one expects effervescent citrus quickly followed by bright, white flowers carried on a light breeze of musk. This cologne however, subverts the genre by using spice (pepper, ginger and cardamom) to create that crackly effervescence, with softly burning cedar and guaiac woods providing the breeze. Cologne Noire is not only the darkest fragrance in the collection, it’s also the most masculine, favouring the world of spiky woods and the sparkle of pepper to create a skin scent that feels wonderfully light in summer and remarkably comforting in the cold. Mark Buxton is a total dude when it comes to this genre of scent and with his entry into the Collection Extraordinaire, he has penned a perfume that is completely in keeping with his style. Gardenia fragrances are tricky; it’s an undeniable fact. The beauty of the flower itself is ephemeral, yielding no oil and never allowing its pungent white floral tones to be captured at the source by the perfumer. Therefore, most perfumes boasting gardenia as a note are reconstructions, perhaps having been created by the use of Headspace technology to analyse the smell around the flowers, and pieced together using a number of ingredients by a very clever nose. Whilst many of these gardenia reconstructions are lovely in themselves, they rarely capture the true smell of the gardenia, which is a thick and creamy odour similar to jasmine but with an earthy, almost mushroom-like smell that contains more than a just a few hints of blue cheese. Van Cleef & Arpels’ Gardénia Pétale however, is a perfume that does, in the opening few minutes at least, capture the true essence of nature’s most elusive flower. As expected, the gardenia-effect doesn’t last forever, but Gardénia Pétale makes up for this with its base of fuzzy, warm sandalwood and sweet tuberose. It has the effect of soft velvet – understated and elegant, but with a definite presence. This is a white floral for any occasion – dressed up or down, and makes for a perfect ‘entry-level’ gardenia, for those wishing to explore the beautiful but dangerous world of white flowers. If I were a lazier writer, I could quite simply sum OrchidéeVanille up a delicious vanilla that any lover of gourmand fragrances should sniff. But seeing as writing is the one thing in my life that I do not have a predilection of laziness for and because this is a fragrance very much deserving of extensive prose, I shall endeavour to elaborate. So yes, this one is a very tasty example of a woody vanilla that neither feels cloying nor overtly dry – in short, it is excellently balanced. 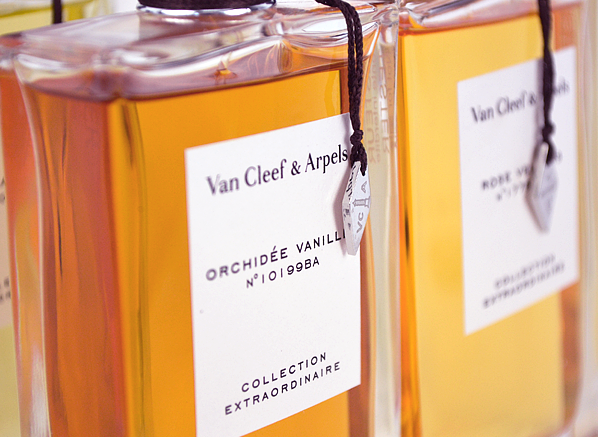 Orchidée Vanille begins with a plethora of tasty morsels for one’s nose to devour; a little pile of orange fruit, waves of syrupy-soft vanilla, a dash of rum and strands of cherry-like marzipan, just to name a few. The vanilla is spicy in a subtle way and displays hints of caramel and chocolate, making for a complex and rich accord that is hard not to adore. On top of all of this, a light dusting of iris powder, shaken over this gourmand like icing on a cake, creates a plush and velvety effect that really needs to be smelled to be believed. Vanilla perfumes so often fall into the trap of being obnoxiously loud and oppressively heavy, Orchidée Vanille however, shows exactly how it should be done – with a slight of hand. It’s delicious, yes, but delicately so and even though one cannot eat it (trust me on this one), this star of the Collection Extraordinaire makes for a satisfying olfactory experience that delivers all of the tastiness of a rich dessert, with none of the calories. Ah oud, that ever-prevalent ingredient that seems very much to be the ‘note du jour’ within the industry at the moment. Every collection such as this needs an obligatory oud and Van Cleef & Arpels’ Collection Extraordinaire is no exception. Their oud however, feels much more like a rich floriental (a hybrid of floral and an oriental) than a typically woody and leathery oud fragrance, and whilst it’s refreshing to see such a take on the note, one would expect that a perfume entitled ‘Precious Oud’ would show at least some hints of the ingredient within its composition. In truth, Precious Oud isn’t very oud-y at all and that possibly makes it the weakest link in a well-rounded collection. That said, as far as florientals go, it’s nicely executed, opening with a slightly medicinal touch of citrus and tuberose, laid over softly resinous dark chocolate, vanilla and sandalwood. It doesn’t progress much on the skin but with time it lightens further, revealing a subtle core of heady white flowers that feel suitably cushioned in texture and distinctly reminiscent of Tom Ford’s grand and dramatic Black Orchid, albeit in a ‘diet’ fashion. The funny thing about rose perfumes is that they very rarely smell like roses in the wild. Rose oils and absolutes often smell of many things rose-like, capturing the complex odours exuded by the flower from sweet jamminess to clove-y and eugenol-heavy spice, but they don’t smell like roses on the bush. Rose Velours, is a perfume that goes a long way to capturing the fresh, dewy and thorny smell of roses growing in the garden and it would be fair to say that it makes for an incredibly easy-to-enjoy fragrance. The rose here is fresh and green, with gingery facets up top and earthy nuances in the base. Supple woods and the gauze-like nature of patchouli provide contrast to the red floral tones, as the fragrance dries down. A touch of iris and a delicate hint of honey further add to the varied mixture of odours that compliment the bulging buds of Rose Velours’ central red rose. Rose Velours is a complex fragrance but it never feels as if there is too much going on. It does thin a little bit in the base, and a touch of something plusher (maybe some vanilla, leather or sandalwood) would have made for a fuller and more-rounded finish, but all things considered it’s a very good example of a natural-esque rose captured in nature. 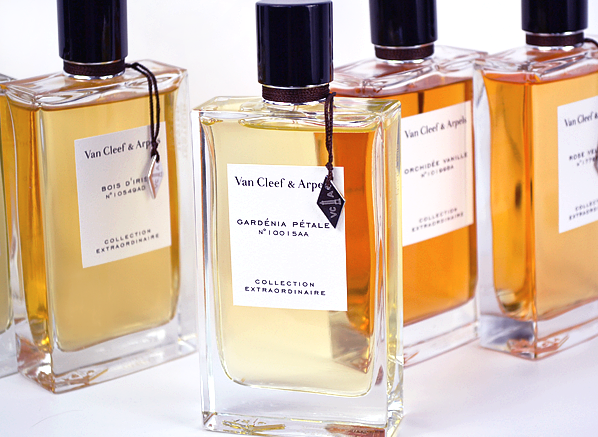 Have you tried any of the fragrances in Van Cleef & Arpels’ Collection Extraordinaire? What’s your favourite? This entry was posted on Wednesday, July 2nd, 2014 at 9:00 am and is filed under Candy Perfume Boy, Fragrance, Guest bloggers. You can follow any responses to this entry through the RSS 2.0 feed. You can skip to the end and leave a response. Pinging is currently not allowed.